On sliding dovetail with probe tip which assures accurate readings necessary for measurement of perpendicularly of sidewalls. Works in conjunction with micrometer and horizontal indicator to show extent of variations and corrections necessary. 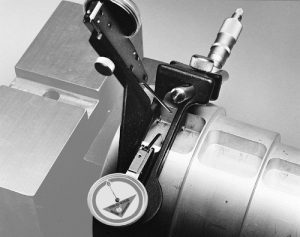 On sliding dovetail with probe tip which assures accurate readings necessary for measuring centering and parallelism of keyway. Works in conjunction with micrometer to show extent of variations and corrections necessary. Provides convenient place for fingers to hold gauge securely when turning or moving along keyway. 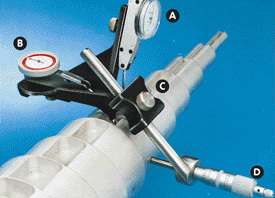 When not in use, gauge can be laid down on either side. Accuracy down to .0005 of an inch (.01mm). Clearly indicates extent of variations, and positive adjustments necessary. 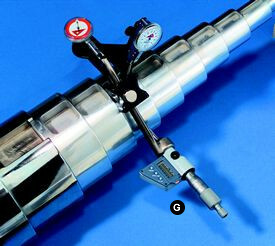 Micrometer is on sliding bar used in conjunction with titanium coated stationary points to position gauge on keyway shaft. Provide for quick, positive movement of micrometer bar, horizontal indicator, and vertical indicator. Precisely machined for stability and ease of placement in measuring keyways on shafts from 5/8″ (16mm) to 6″ (152mm) in diameter. Optionally Equipped with Mitutoyo digital micrometer heads with 50 millionths reading for data collection. © 2018 Dreier Corp. All Rights Reserved.